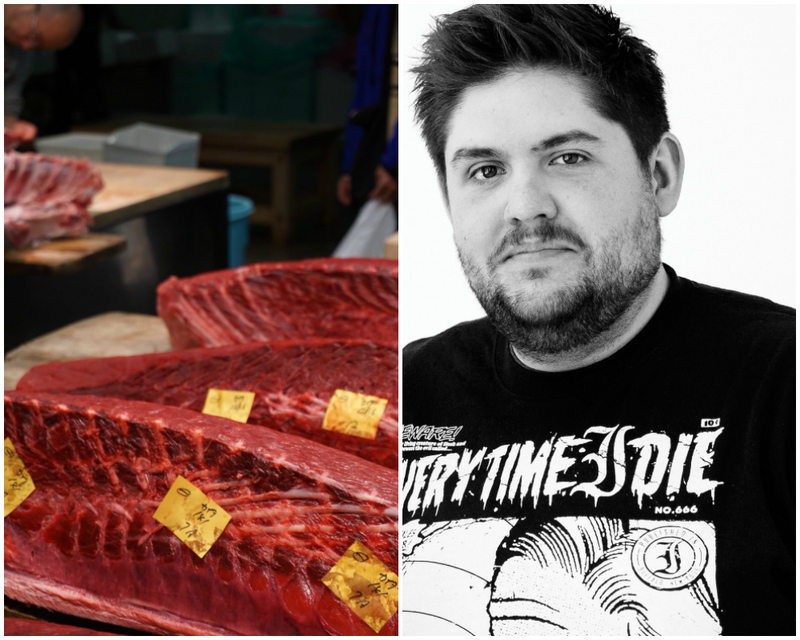 While in Japan collaborating on a New York-inspired tasting menu at the legendary Park Hyatt, Fabián von Hauske and Jeremiah Stone visited the newly-opened wholesale marketplace. Earlier this month, Contra chefs (and 2016 F&W Best New Chefs alums) Jeremiah Stone and Fabián von Hauske took up residence in Tokyo—at the legendary Park Hyatt—where they worked with the property's chef de cuisine Steffan Heerdt on a New York-inspired six-course tasting menu made with local and seasonal ingredients at the hotel's New York Grill. While in Tokyo for the first time, Stone and von Hauske visited the new Toyosu fish market—the world-famous location of the world's largest fish market, which housed more than 600 vendors in Tsukiji, closed on October 6 and has since relocated to a waterfront location in Toyosu. "The first thing you see is tuna on the floor—like a frozen tuna statue—at the tuna auction," von Hauske tells Food & Wine. "We saw all the suppliers, people selling uni and shellfish. The produce section was full of different fruits and vegetables from all over Japan—some of it was very good and some of it was not what I expected, and the prices were insane!" Visiting the new fish market with the Park Hyatt team was also a window into another world for the Michelin-star chefs. "When you're working in a hotel, it's very different—the volume is so much more—you have to compromise when you're a 30-seat restaurant," von Hauske says. "It was very valuable and it helps you understand [the culture. Where I'm from, in Mexico, there's great respect for craftsmen—for people who do very simple tasks, one thing, because it's all about the product." Von Hauske's best advice for anyone visiting Tokyo for the first time? "If anyone gives you a list of places [to eat], you should just throw it out and go wherever you want," he says. "Wherever you go, you'll have a great experience." "I noticed that, I think that we, in the States, in western culture, we take for granted aspects of hospitality," von Hauske says. "Sometimes we think doing something is doing too much, or being too hospitable, or being too nice. But in Tokyo, at the smallest restaurant you went to, someone would give you a hot towel when you get in, or maybe a cocktail, a little soup, or an iced tea—they're all small details, if you think about it, if an eight-seat bar can pull it off... At so many restaurants in New York—or at certain restaurants—they treat people so poorly, as if people should be grateful to set foot into the establishment. It's such an insane thing. Learning to be hospitable is in all the small details."